LOL, All gut strings too. That's from the Lady Blunt Strad, very awesome fittings(with the rose pegs), Le Messie Strad and the Kreisler Strad have those as well, they were made by Vuillaume. I've seen some "copies" of those fittings from ebay before, though not carved that well, I had a thought on buying it, but then I chose the one with the bone decorations to match the nut. Very nice tail piece, but lacking fine tuners unless you want to install Perfection pegs. It's really easy to put fine tuners on a tailpiece but do you guys realize that the sound of a violin is compromised by fine tuners? Not much IMAO but with both the after-length and the added equipment to the instrument. so is that why built in tuners are the better choice ? I have gotten away from fine tuners and I like not having them now... I like the simple look without them and it forced me to learn to be very good at peg tuning. I love not having them actually. off topic as usual. I love love love this tail piece. So pretty. I think with the, 'Wittner', tailpiece your after length doesn't change as long as your tail gut is adjusted properly, but I guess that goes with any tailpiece used. I think that with tailpieces, tuners, afterlength, and etc, it boils down to "If you like it and feel it works well for you, it is excellent." I do like the Lady Blunt tailpiece, though. The carving is quite charming, nicely detailed, and it is a very pretty bit of wood. I am with you Dan.. It is amazing.. I love it soo much. This tail piece. These are my favorite tailpiece with built-in fine tuners and do not affect the after length negatively. All the strings rest exactly where they would have without fine-tuners. I actually have one of these on my own violin though mine has only fine tuners on the E and A. They used to offer the two fine tuner option but 4 is mostly what is available today. Unfortunately, they are pricy. So if you wanted the ability to 'fine tune' and not upset your afterlength and add weight at the tail piece, wouldn't the best solution be no fine tuners on the tailpiece and use geared tuning pegs? One can fine tune with regular pegs provided the strings are not solid steel, but yes Ferret. 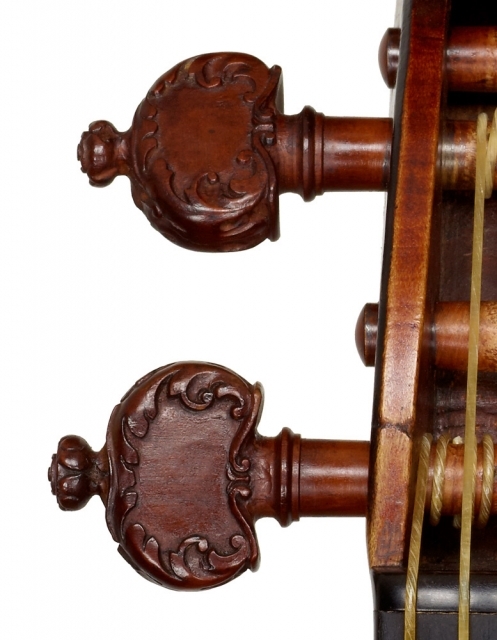 However, the weight of the Pusch tailpiece is not more than regular quality tailpieces and achieves the same result as fine tuners you can add to a tailpiece. Geared pegs are not perfect and don't last as long as friction pegs and must often be installed by professionals, but many people love them. They are great for many reasons but not suited for everyone. I for example, don't like taking the time to change strings on violins that have them. I can change all four strings in less than 5 minutes on a regular violin. Also, I can tune violins in seconds using friction pegs. Here are the Lady Blunt pegs and the Le Messie tailpiece, very beautiful! One has to kind of wonder if the carving on the tailpiece (allowing for a bit of wear over the centuries) might have actually been a sort of portrait of Lady Anne Blunt, the violin's first owner. Perhaps the way the violin is being held in the carving is how she played. 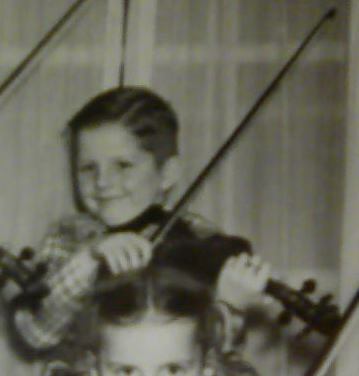 Not everyone has always played with the violin under the chin, as we think of it today. Plenty of carvings and paintings showing it being held in assorted ways, and holding it in this fashion is shown in some old paintings and carvings. I tinkered around with it a little, and I think that at least with a shorter bow (as shown and as was common back then) and some practice, it would likely be workable enough at least for some sorts of music. At least for a person that was used to playing that way and had gotten to learn the method for doing so from teachers or others who also played in that fashion. It might not work well for playing modern style violin music, but the way it was played almost 300 yrs ago, it may have been pretty good, for all any of us can know. One can assume, though, that Antonio Stradivari did not carve it that way by mistake or because he was ignorant of how the instrument is held. I did not put on fine tuners when I changed my acoustic violin's carbon tailpiece with built-ins for a plain one of pretty ebony I was given. I had been using fine tuners since I started, but wanted to know if it was all that hard to manage with just tuning from the pegs. Even the plain steel strings, I've never found particularly difficult to tune with just pegs. Fine tuners *are* nice for quick touch-ups to the tuning, though, and I have the tailpiece that had them built in on my electric now. There isn't much (if any) difference in how long it takes me to tune the acoustic without fine tuners and the electric that does have them. It doesn't take long to tune either one of them. In the end, it boils down to what you like, and what you get used to. Friction, gears, fine-tuners or not. It's all good if it works for you and you like it. It is *your* instrument. Set it up with the fittings you prefer. I personally do agree with Toni, in that I like the look of my acoustic without them. I do feel my particular violin does sound a bit different without them and I do like it better for the acoustic. But that would be something I'm pretty sure would vary from instrument to instrument and by personal tastes in the sound you like.